I have previously expressed concern at how recent fines by the ICO for charities carrying out activities such as wealth screening, have created an environment of fear and uncertainty as to what is lawful. Charities planning to develop major donors, and even those with well-established major gift programmes, are nervous and unsure how to proceed. Nahira Consultancy and Prospecting for Gold have therefore teamed up to run a workshop ‘Finding your Treasure’, which will tackle these questions and more. The starting point of any successful major gift programme is to identify prospective donors, which includes understanding more about their background, wealth, connections etc. 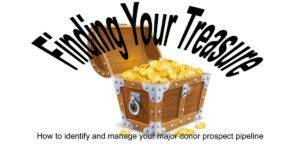 For smaller charities without dedicated major donor fundraising resources, this task may seem daunting. This workshop will introduce a simple process for identifying your prospective donors, provide guidance and resources on carrying out prospect research, whilst ensuring you’re staying within the laws on data protection. • How to make sure you’re complying with Data Protection legislation, including how to develop and use your privacy notice and document your legitimate interest.